By booking the All Inclusive, Island Style package, you enjoy the exclusive use of our kayaks, paddle boards, snorkel gear, and other non-motorized island toys at no extra charge. Explore the surrounding waters, relax in a hammock or bask in the sun. Our activities staff are happy to get into the water with you to help you get started or to provide tips on your technique. If you are interested in seeing the surrounding waters and islands in a different way, check out our island excursions. You'll love living the island life, trust us. Travel around the Cayes to hunt for your dinner! This is a snorkel adventure where you hunt Lobster (from June - Feb.) or Conch (from Oct. - June) and experience the underwater beauty of Belize. Travel to Tobacco Caye, Carrie Bow Caye (Smithsonian research facility, seasonal), South Water Caye and Bird Caye. Learn about the history and culture of the Cayes in Belize. An hour long cruise around the Caye. 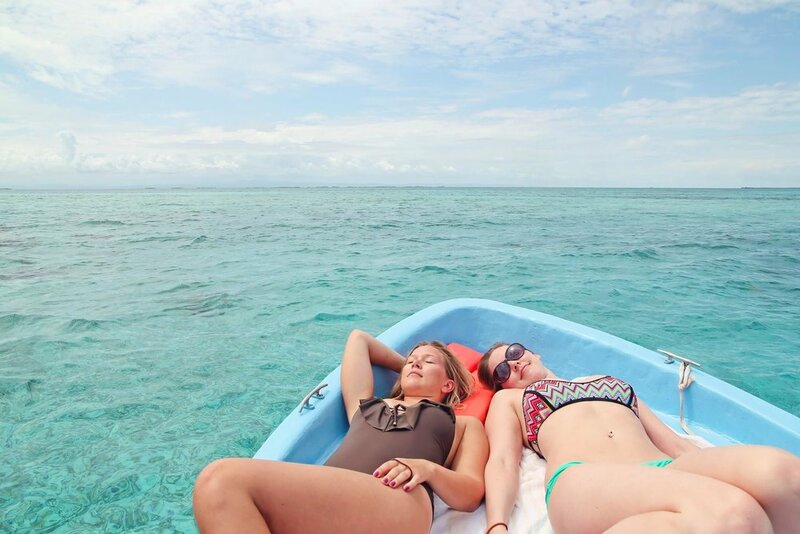 Enjoy a bottle of champagne and a romantic boat ride under the beautiful Belizean night sky. Your boat captain can tell you about the different constellations and star navigation or just enjoy the peaceful serenity of the silence. Maybe you will see a shooting star or two! This is an exclusive tour, so make sure to book yours first! Enjoy a boat ride up the beautiful Sittee River. Look for crocodiles, iguanas, river otters and the elusive manatee. Picnic lunch is provided. Enjoy our yoga and fitness palapas on the end of the island. Serenity Point also offers a beautiful access point to the tourquoise Caribbean Sea. Included with any package purchase. The best way to travel around our little private island is with our complimentary bikes. We have 10 brand new bikes on the island, just for your use! Standup paddle boarding on the turquoise water is magic! Discover the quiet and calm of Thatch Caye Resort surrounded by shallow water… just you, your stand up paddle board or kayak and nature. Here, you can explore the reef, and even meet stingrays, sea turtles and barracuda. Your sea kayak journey can take you places that few other people have a chance to experience.